Pigs who will live their entire lives at our farm. Yes, that is what I said a few days ago. Our top secret big project for the past year and a half is a butcher shop. Well, about as top secret as anything is on a small planet. The gossip has been fun and I’ll admit that I have fueled the stories a bit. This big project is what has put a slow down on some other more minor projects like expanded fencing, new pastures and the greenhouse. Although we were able to get bits of each of those done so they’re ready for more later. Everything in its time. Rest assured that this is not the case, the rumors of my conversion to Big Ag are grossly exaggerated and unfounded. 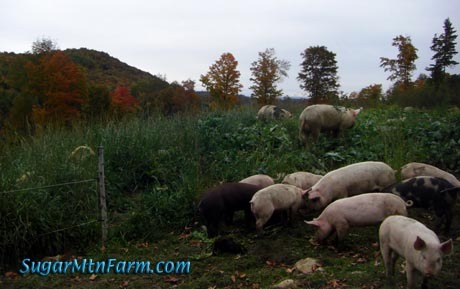 We are still a small family farm raising Naturally Grown pastured pigs sustainably on pasture. Having our own on-farm process does not change how we farm nor our fundimental beliefs and core values. Heck, I can’t even get a loan never mind a temptation on the mount. What this does do is improve the end of life for our livestock, improve the quality of the meat and increase our farm’s financial security. Again, none of these statements are true. I mention them to get the white elephant off the sofa and out of the room. These objections are a result of not understanding what the parameters are for a special case that solves our specific instance of the problem. For other farms the results may come out differently. We are building a USDA/State inspected on-farm slaughterhouse, butcher shop, smokehouse and linked sausage kitchen. For simplicity sake and to avoid twisting my tongue over that long phrase, I’ll just call it the Butcher Shop. 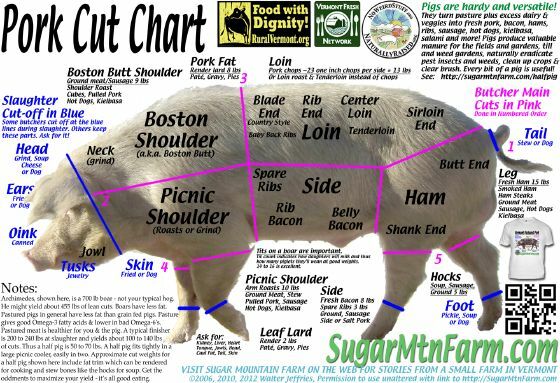 We need USDA inspected because we transport our meat across state lines in order to deliver the large batches of our all natural pork for hot dog making to the smokehouse in Massachusetts. Theoretically the new rule will allow state inspected meat to cross state lines but the regulations for state and federal meat inspection are the same so we are building everything to meet and exceed the federal regulations. temper-tantrums by two plant owners (Is he in a good mood this week???). These errors cost us $114 extra per pig above and beyond the cost of the processing, transport and raising the pig. Week in and week out that adds up to a lot of money over the course of the year. It is a stress that neither the the animals nor we need. All told the hired processing costs us more in time and money than doing it ourselves, even with the cost of building and operating our own facility. Some butchers are excellent. They care about their work and are masters at their craft. They are an unfortunate minority. If you find them, cherish them, nurture them, encourage them. Sadly they ultimately retire and too few have the USDA certification we need for sales to the stores and restaurants that buy from us. This leads us back to the positive reasons for doing it ourselves. Blackie with a new generation who may not travel. When livestock are forced to travel for hours to get to slaughter they are significantly stressed under even the most ideal conditions. We transport our pigs inside our van[1, 2] so they have the same conditions as ourselves but it is still a stress, for them and us, going to a strange place with strange noises, unfamiliar scents, sights and people. On-farm slaughter means the animals avoid all of this transport related suffering: their life is humane and their death is humane. 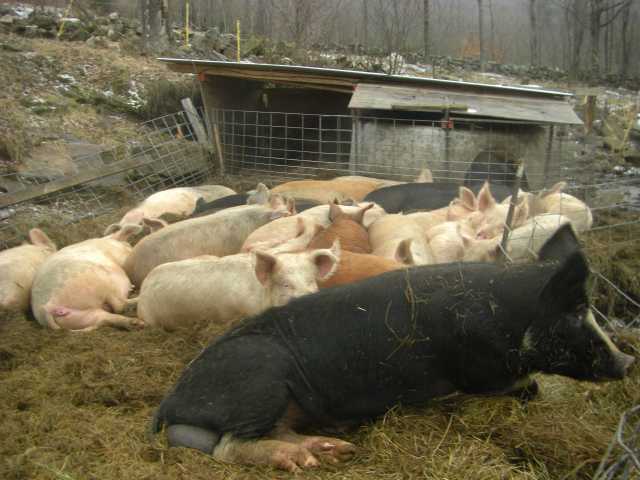 It seems strange to spend so much effort breeding, farrowing and raising our livestock on the low stress, familiar pastures here at our farm and then to truck pigs for three hours every week to distant slaughterhouses where they are handled by strangers in a strange, stressful environment. It is like taking two steps forward with Naturally Grown and then one step backwards at the end of life. We can do better than that. On-farm slaughter means that the animals are able to stay their entire lives here in familiar surroundings and be handled humanely by us, their familiar people who care. Vermont, New England and much of the country have been losing small butcher shops and slaughterhouses for decades. In last few years several burned down and other butchers have retired. In April of 2008 the butcher we work with the most told us he intended to stop doing slaughter for anyone other than his own farm. This motivated me to move forward with what I had been working on since 2004 – having our own on-farm capacity. When I contacted the Vermont Department of Meat Inspection that week they told me that another butcher we sometimes worked with was planning to retire. This further accelerated our drive to do our own processing. It was becoming more and more clear that we could not depend on an outside source for something this vital for our farm. If we can’t get our livestock to customer plates then the farm is unviable. Originally I had not planned to start this journey until 2014 but the time is now. With hired slaughter and butchering we must drive three to twelve hours every week to drop off the livestock one day and then pick up the meat a different day. Unfortunately, while we’ve tried, it just doesn’t work to pickup and drop off on the same day. Doing on-farm slaughter will save us as much as 660 hours of driving annually, 37,440 miles and 2,340 gallons of gasoline at a cost of over $7,000. That is 19.4 lbs/gallon x 2,340 gallons = 45,396 pounds of carbon-dioxide (22.698 tons) a year saved and not emitted as CO2 into the atmosphere. As a Vermonter, I’m all for a little global warming to take the edge off winter but pollution isn’t a good way to achieve it. The driving back and forth to the butcher is our number one fossil fuel consumption. We use very little on our farm and home putting in only a few hundred hours a year on the tractor. In fact, our farm is a net Carbon sequester sucking up about 1,400 tons of carbon a year out of the atmosphere via our forests and fields. With on-farm slaughter cutting out the driving to and from the processor we’ll be just that much greener and our carbon foot print just that much smaller. In addition to driving one third as much we can save energy in another way. One of the major problems with the butcher we work with the most is that he fails to properly cool the meat. This means that we can’t do an efficient driving pattern of dropping off the pigs one week, then the following week dropping off more pigs while we pickup the previous week’s meat. We tried that and got rotten meat. He, of course, won’t cover the loss. The farmer is stuck in the middle, composting inedible meat. Part of the problem is his cooler, even the new one he just put in, is poorly designed and insufficiently insulated. I can do far better than that. In the floor plan below you’ll notice that more than half of the building is a heavily refrigerated box. Using a variety of natural cooling techniques and some basic physics along with modern refrigeration, we can easily chill down that large box. Located within that box are successively smaller boxes, each colder than the previous. The coldest is the deepest. Some time I’ll post more about the technology – it is worthy of its own detailed post. The result is stable cold with less wasted energy in order to achieve higher food quality and better food safety. Like the Russion dolls, boxes within boxes. 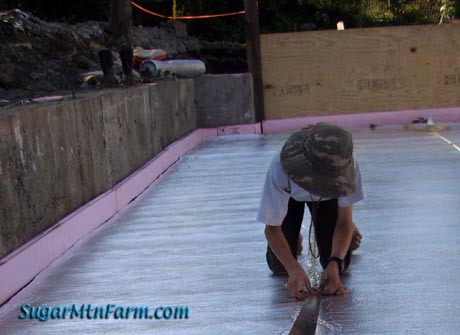 Thus the massive super insulated slab. For our customers on-farm slaughter will offer higher quality meat. When animals are stressed it raises the pH of the meat, changes the water holding capacity and lowers the quality. Livestock slaughtered on-farm avoid all of this resulting in higher quality meat for the consumer. Another benefit for our customers is that once we bring the processing in-house we have more control over our costs and have eliminated more waste. This means we can keep our prices lower bringing high quality meat to the table at reasonable prices. We are often asked for custom cuts of meat that the volume production line butchers don’t want to waste their time with. Doing the work ourselves means we can offer this extra level of service and specialty cuts for our customers. Tri-cut knuckles, soup bones, back fat, skinless jowl and bellies, Frenched ribs, nine-rib roasts, skin on shoulder roast, kabobs and linked sausages are just a few of these specialty cuts we’ll be doing. Eventually we’ll even be able to do our own hot dogs, kabasa, salami and pepperoni. The cost of hired processing is about 47% of our gross income. Ouch. For every $100 we earn we pay out $47 for processing. Another 25% goes for farming overhead and winter hay. The bank takes most of what’s left – fortunately we live very frugally. Every year I look at these numbers. The one thing I can do a lot about is cutting the cost of processing. If we do our own on-farm processing we can more than double our net income without raising our prices and without growing big. This means we won’t have to increase prices in this tight economy which helps our customers too. I know how to cut meat. I’ve done it for our family for almost 20 years. For the past year and a half Holly, our son Will and I have been taking commercial meat cutting classes and apprenticing at butchering with master butcher Cole Ward. We can do the work and recapture most of that 47% of costs we pay now for hired processing, money that could pay for building a butcher shop. Vertical integration helps keep more of the money on-farm and gives our customers better prices and higher quality. This past year the butcher and the smokehouse we work with the most jacked their prices up on us by 36%, retroactively. That is to say we delivered animals and meat to them but when we got the bill it was 36% higher than the previous time with no warning. Since we had already sold all that meat we had to eat the higher prices. We never do that to our customers. If we have to raise our prices we give them a month’s advanced notice and nothing in the queue goes up. We’re honest. This retroactive price increase cost us a full month of our family’s income. Why can they get away with this dishonest practice? Because they have an effective monopoly since there are too few slaughterers, butchers and smokehouses. Don’t try complaining though, they’ll cut you off. The solution is vertical integration – bring the processing on-farm. Over the past decade several slaughterhouses have burnt down, one was just shut down last month for inhumane animal handling, another butcher retired and one stopped taking outside animals. We are left with very few available slaughter and butchering options. Only counting those who are state or USDA inspected reduces the number further. In the fall, with hunting season and animals coming off of pasture, this problem is amplified with many farmers not being able to get slaughter slots in the butchers’ schedules unless they reserve four months in advance. The rush of the fall schedule also creates far more errors in processing at the butcher which wastes more meat and costs us more money. Likewise, with so many animals being handled, they’re less careful and some of the people are less experienced part-timers hired only for the season. Without slaughter and butchering capacity we can’t get our pork to the customer’s fork. The loss of slaughterhouses and butcher shops is hurting all farmers. On-farm processing capacity is vital to the viability of farms. With us doing our own we will free up valuable slots in the butchers’ schedules for other farmers thus benefiting the entire community. So even though we won’t be doing processing for other farms, our butcher shop benefits the whole farm community and consumers. We have breeding herds of livestock and this means that biosecurity, keeping our animals healthy, is doubly a concern. We have spent many years selectively breeding our pigs to improve our genetics. It is unavoidable that the slaughterhouses are going to be a concentration point for disease. Every time we go to another slaughterhouse we risk bringing back disease on our boots. (This is when Pro-NAISers can shout “This is why we need NAIS“ to which I’ll reply “But not at the loss of our Constitution.”) To combat this risk I have a separate set of boots in the van for while I am at a slaughterhouse. On-farm slaughter improves our biosecurity, reducing the risk of disease being introduced to our herd. Lots of small butcher shops serving lots of small farms scattered around the country side would do more to improve national food safety and security than NAIS or all of its ilk. The limits of transport and available slaughter schedules have held back the growth of our farm. Chefs need consistent weekly volumes of fresh meat, not just when the butcher wants to process. Without consistent processing we can’t grow our farm. The cost of processing eats up half our income. Our goal is to remain a small family farm but we must do enough sales per week that we are able to achieve economies of scale that make farming pay a livable wage. We are profitable as we are but there is no savings other than our land and not enough money for health care. Par for the course with farming. The economics, the cost per pig, get much better at six pigs a week and at ten pigs a week there is a future in farming for the next generation as well. With on farm processing, we will be able to be profitable with lower sales levels and that means we can keep prices down for our customers. At the same time, it assures the next generation on our farm, our children, a future which they have said they want. 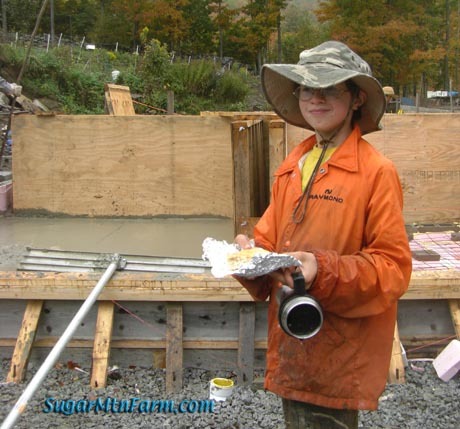 Our kids want to farm* but they must be able to make a living at it. On-farm processing removes the processing bottleneck while giving added value to our pastured pork. This means that more of the income stays here on the farm. Through vertical integration of breeding, raising the animals on pasture and on-farm processing we make our farm that much more sustainable. There is an irony in all of this. Back in 2004 I was researching what was involved in having our own on-farm slaughter when I discovered documents on the USDA web site regarding the the National Animal Identification System (NAIS). This led to NoNAIS.org which was rather a bit of a distraction. Interestingly, under the way the rules are written for NAIS a farmer could be pretty much exempt from NAIS if they had on-farm slaughter – one more reason to bring slaughter home. If your stock are born, bred, raised and slaughtered on farm then NoNAIS. Of course, that doesn’t deal with the need for new genetics, people getting started, those who just raise a feeder pig, calf or lamb over the summer, etc. Even with on-farm processing it is critical that we all continue to fight against government and Big Ag interference with our lives and their trampling of our Constitutional Rights. My drive for on-farm slaughter predates NoNAIS. Keep pushing for appropriate scaled farming alternatives and to protect our rights. There is no single reason that has driven or attracted us to on-farm slaughter, rather it is a convergence of many causes, both positive and negative. For us, on-farm USDA/State inspected is the right move for for our livestock, for our customers, for our family, for our farm. We’re doing it ourselves. There are a lot of studies and reports out on the web detailing various committee conclusions about the problems with the lack of slaughter, how it is affecting farmers and consumers, what it is doing to our rural landscape and how to create more slaughter opportunities. These reports are very helpful to read and give an overview of the issues. The problem is large committees of people can’t react quickly, can’t move fast and they are thinking too big – at least for us. The usual way to build a slaughterhouse, butcher shop and smoke house, also known as a meat processing plant, is to involve a lot of consultants, engineers, designers, contracters, committee members and a working group. This is very expensive and the final cost will be $500,000 to $2.4 million according to reports I’ve read. Worse yet, it takes about 10 years, if it gets completed, if it is actually started. Because it is so expensive to build and operate they must design these facilities for a large volume of processing to break even within three years, the typical goal time. The large processing capacity means bigger volumes of waste, more waste water, more resources, higher costs of construction, a bigger work force, lower quality jobs, higher line speeds, more animal abuse, more work injuries, unions and all sorts of negatives for society. It’s a feedback loop that spirals upward in costs and downward in results. Often it just doesn’t happen because the project is too big and the participants give up. At the top of the line you have the mega-processors like Tyson, Cargil and Smithfield who process hundreds of thousands of animals a day. The USDA defines three types of processors: the big guys, small scale and very small scale processors. The latter do much more limited volumes. Individuals and small farmers like you and I deal with the smallest of the very small scale processors. That is all that we have here in New England. Unfortunately all of the reports I’ve read by study groups focus on creating much larger regional processors which means there would still be large amounts of trucking of livestock, high impact on neighbors and poor food security. If one regional processor fails, like the recent fires or humane animal handling issue here in Vermont, it affects a lot of farmers who are all of a sudden scrambling to find unavailable processing slots in the over booked schedules of the remaining butchers. No, we don’t need another big processor – we need many small local butchers serving the community around them or even their own farms. We need to think a lot simpler. Think small. Think very small. Think nano-scale. Think just enough capacity to process for a few farms. If everything is kept on-farm then the offal, the waste materials from slaughter, can be composted returning the nutrients to the soil. The waste water shrinks down to a small, manageable septic system. There is no transporting of large numbers of animals onto the site. No holding animals in large stockyards as they wait for slaughter. Everything gets simpler and exists on a more easily managed scale. This is what the very small scale traditional neighborhood butcher shops of yor were like. What we need is a new definition: nano-scale processors who do just for their own on-farm slaughter or a small number of farms around them. Their needs are different than even the very small scale processors. Our butcher shop is ~1,300 square-feet. That’s smaller than a single room in most very small scale meat processing plants. With good design it all fits and allows for future expansion. Our need is small since we process weekly for immediate delivery. Our facility is small, about the size of one room of many facilities I’ve seen. There are just the three of us plus an inspector so we don’t need as much room. One species (pigs) rather than half a dozen different animals to start with. Initially just for our farm (simplified permitting, insurance, regulations and biosecurity for our herd). Just one day of slaughter a week on a different day than meat cutting. We work temporally sequenced giving better food safety and sanitation. We are a tightly knit working group. We are able to be flexible, adjusting to work with the weather and other resources. Small steps at a time (HACCPs for just slaughter and cutting to start with). 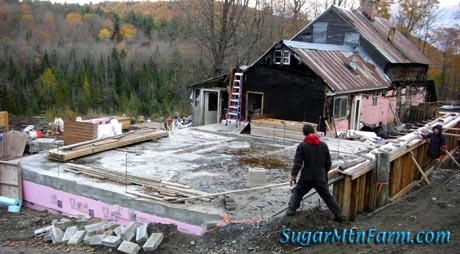 Construction on an existing foundation which saves on permit requirements. 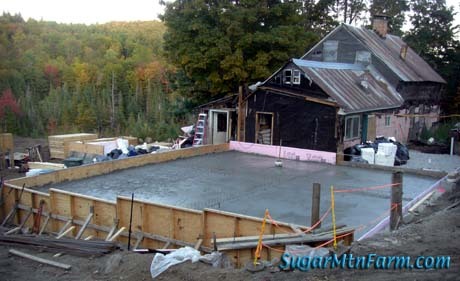 Construction techniques we know from building our house and other structures in concrete. 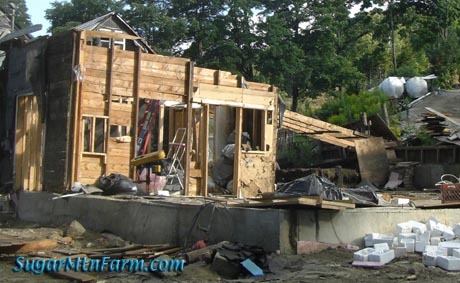 Labor is the biggest part of the cost of construction – we do our own. Labor is the biggest part of the cost of processing – we do our own. Since I am the designer, architech, plumber, electrician, user and owner, I have have insights into efficiency that other people would miss. We can build a better facility by integrating all of these disciplines. I have designed and built two manufacturing facilities before so I do have a little experience in the general topic. Simplifying the problem and focusing on only the parts that we need now breaks the project into more easily managed parts. We are starting with slaughter and butchering. Later we will add roaster pigs, sausage making, linking, curing, smoking and other aspects. For now we are focused tightly on just what we need to meet the demands of our roughly two dozen existing customers on our local weekly delivery route. Handle beef, sheep, goats, etc with an aging room. Refrigeration, kitchen, and other spaces can be expanded. Processing of off-farm animals could be added. I would rather not go there, particularly the last one, but planning for the future and eventualities is important. Permitting, insurance, composting, disease control and a whole lot of other issues are greatly simplified by focusing on just on-farm processing so that is how we’ll try to keep it. We need reliable weekly slaughter. Every week. Mobile slaughter is more of an occasional tool. A mobile slaughter unit will have the same scheduling problem as hired slaughter does now, perhaps worse. 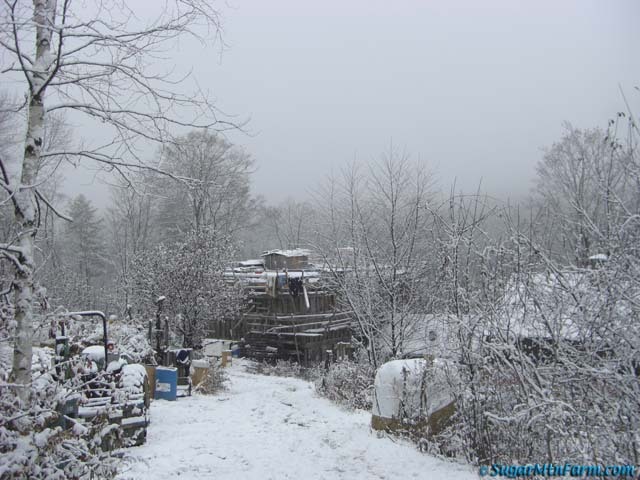 Our farm is up on a mountain on a back road that is not passable by the big mobile slaughter trucks during much of the year either due to mud seasons or snow and ice. Our van can make it as can other small vehicles but not a tractor trailer truck on bad days and there are a lot of those. The mobile slaughter units only resolve the slaughter end of the problem, not butchering and it is in the butchering where most of the cost, errors and waste occures. The cost of mobile slaughter is actually higher than existing plants. There are no mobile red meat slaughter units around here. A mobile slaughter unit still requires the well, septic and electric we had to do anyways for our butcher shop so those costs are incurred either way. Building a mobile slaughter unit costs almost as much as what we’re doing. So mobile slaughter just isn’t a good fit for our farm. In flatter country with more mild weather it may work well for other farms. Different solutions for different problems. At the foot of our driveway by the road because that is the location of the old foundation. *** Eliminating transport is key. This way the animals can walk and are always in familiar surroundings with familiar people – us. They will follow a migration pattern through their lives across our farm from the breeder herd pastures to the maternity pastures to weaning pastures, growing pastures and finally finishing pastures which lead them right to the lairage. Each of our three herds, north, south and east (to come), will be able able to work in this manner. This makes for a minimum of stress and easy transitions as they go through their six months of growth. It raises humane farming to a higher level, to the level we had in the old days when animals did spend their entire lives on the farm and were not trucked to far off feed lots and slaughterhouses. This pattern of life will use the advantages of managed intensive grazing and all-in-all-out livestock management all built into the farm as a system. A key permitting issue is on-farm vs off-farm sources. If you are bringing in animals from off the farm it can quickly change you from a farming activity to industrial, and the permitting gets more complex. By doing only our own livestock we are classified as agricultural. Importantly this means we can compost all of the offal, recapturing those valuable nutrients, saving the cost of rendering as well as not being required to have a huge, unnecessary, expensive waste processing plant. After all, there isn’t the waste to be processed – it is a resource. A simpler, better greener solution. 2004 I began researching how to do our own on-farm slaughter and butchering. I incidentally ran across NAIS. Those dang windmills just beg for tilting. 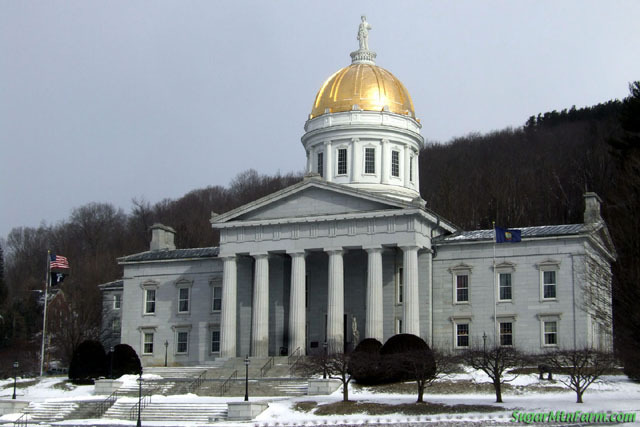 May of 2008 we met with the Vermont Department of Agriculture Meat Inspection department heads. They have been most helpful and encouraging as has the USDA regional office and inspectors. Over the course of many meetings, phone calls and emails they have assisted us with our HACCP/PR (food safety) plans, floor layout, plant design, regulations and code issues. Over the course of the next year our plant layout, HACCP and SSOP evolve. June 2008 began taking commercial meat cutting classes and apprenticing with a local master butcher after attending a workshop with the NH Pork Producers. Apprenticeship continues to this day. 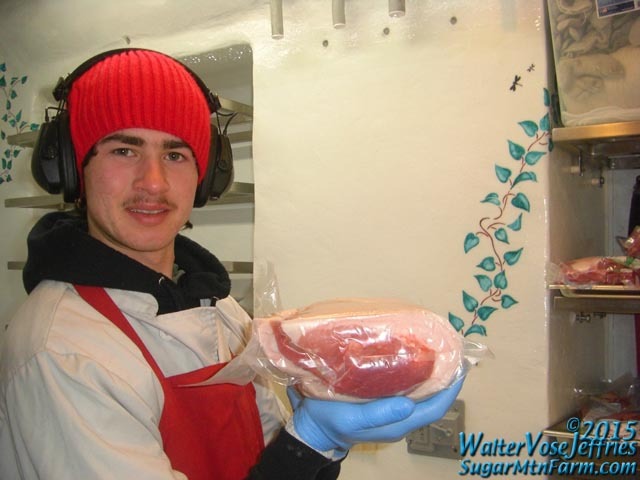 Winter 2008/2009 completed our HACCP training and basic PR/HACCP plans. Final approval of plans will be after the plant is in concrete. Doing the plans first, while designing the layout, helps make sure both the plans and the plant layout work smoothly together. June 2009 completed all of the permitting for our project and have in hand the approved design for our wastewater (septic) system. Offal will be composted separately to recover nutrients. 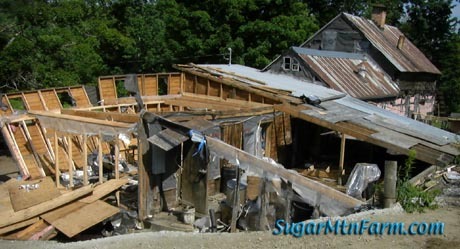 July 2009 tore down the old hay shed where we will be building our facility. August 2009 installed new underground electric and improved the road access for the facility. September 2009 completed the concrete pours of the super insulating foundation and pad for the refrigerated sections, slaughterhouse and administrative space. 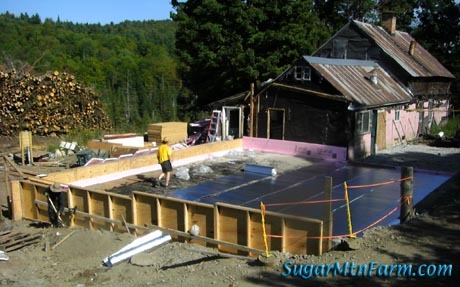 By putting so much insulation into the slab now we will save a great deal of money over the years through reduced energy costs. 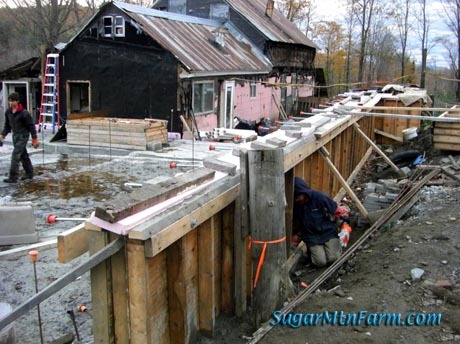 October 2009 poured lairage and west side retaining concrete walls. November 15th, 2009 Outside wall forms up for structural walls, inner wall bases for administration, lairage and reefer completed. October 2010 Setup forms for 2010 concrete fall pour. 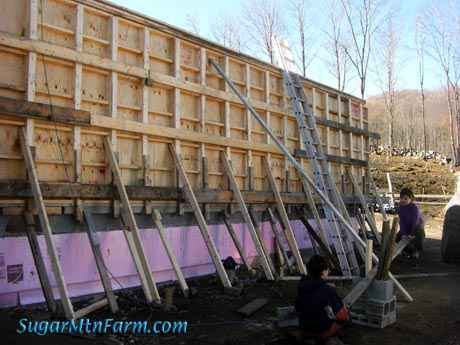 November 2nd, 2010 Pour 2nd level of concrete walls for entire building plus lairage sub-floor. May 1st, 2011 – Spring ice has melted from forms, snows are finally (mostly) gone and we have begun taking down the reefer inside forms. Summer 2011 – Reefer interior slab and plumbing completed, lairage sub-floor and plumbing poured. 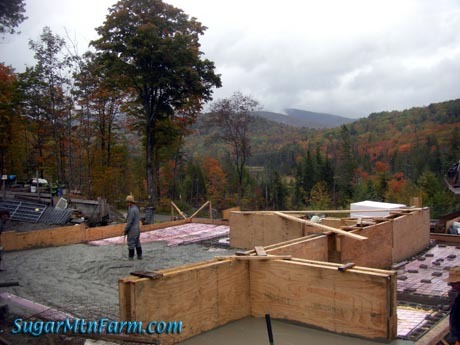 Fall 2011 – Reefer interior walls and vaulted ceilings poured in concrete. 2015 – Interior of Phase I Admin iCutter finished, licensed. 201001 Update: Without bank funding and with winter closing in our schedule ground to a halt as the freezing weather and high winds arrived. For now we wait on the snows. Come late spring when things are melted and the ground has solidified enough for the road to be safe for big concrete trucks we’ll continue with pouring concrete, closing in and onward to our own on-farm processing. 20151009 Update: Today we received our license to begin butchering under inspection! Aye, there’s the rub. 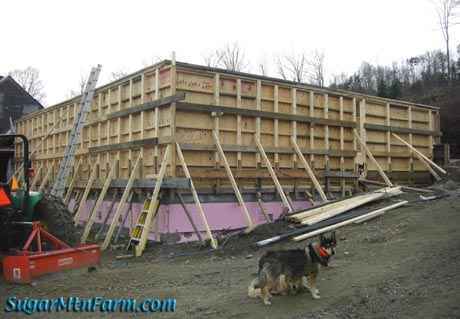 By standard formulas a meat processing facility costs $2.4 million dollars to build. They’re thinking too big. Doing it our way we can build and equip a nano-scale butcher shop for about $150,000. That is doable and will pay back in under five years compared with the cost of hired processing. This brings us to the inescapable conclusion that the problems are often one of scale. Think small, think very small and think local Community Supported Agriculture (CSA). One thing that helps with the cost is we already own the land saving that considerable expense. To date we have spent about $26,000 of our own money bootstrapping our project from the base foundation up. 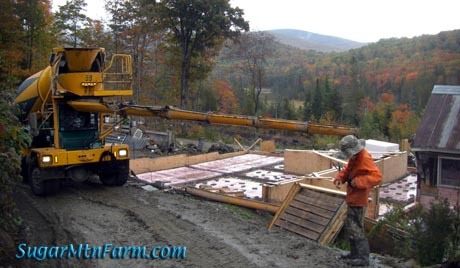 This covers our septic design, permitting, wood for forms, concrete, insulation, rebar and other construction materials. This, of course, does not include any charge for our labor but this is a farm and farmers don’t get salaries or hourly wages – we get the satisfaction of working outdoors in the beautiful country weather. Preferably before the snow hits the concrete. 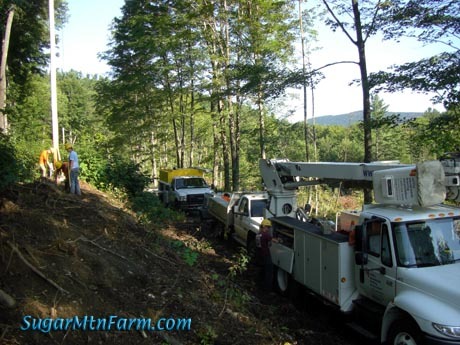 In addition to what we have personally spent we have recently received loans from another local farmer, an excavator, lumber yard and electric supply company for $22,000 in the form of cash, services of big equipment and extended payment terms on supplies. All greatly appreciated. Every little bit helps make the project become a reality. Another source of funding is that several existing customers have bought CSA style pre-buys. In essense people pre-buy a pig, paying now to help with financing the butcher shop. In exchange we are offering free processing which normally costs about $180. Community Supported Agriculture at its best. We are offering this for whole, half and quarter pigs – I’ll post more details soon. Getting the butcher shop up and running is a big push for us. Rest assured that while we are growing our farm some, we are still the same small family farm that cares about the lives of the animals in our hands. The on-farm slaughter and the butcher shop will make everything just that much better, for all the right reasons. **There is a wealth of information available on the internet, through third parties, the USDA and the Vermont Department of Agriculture. There are many helpful people in these agencies, at universities and quite a few butchers who are generous with sharing their time and knowledge. The digital age has made this easier than ever before – wheels don’t have to get reinvented as frequently and designs can be improved by looking at other people’s work more quickly. Even the USDA’s videos about Listeria are wonderfully revealing about plant design through careful observation of what is behind the scenes in the shots. In future posts I’ll provide lists of available resources that goes beyond the links in this article. ***One of the key issues I discovered in permitting was the government doesn’t like people “breaking new ground.” If we are building on an existing foundation then it makes the whole permitting process simpler. The take home lesson is read the regulations and understand why they were written. ****Compost is the way to go – the ultimate in recycling. Ironically the original reason we got livestock decades ago was to get the high quality fertilizer from their manure for our gardens. Over the past few years I’ve been practicing composting large animals so I’ve gotten a chance to explore this. Interestingly, while some places ban composting, other states like Vermont and New York strongly encourage it as the best solution for farm mortalities and slaughter wastes. We’re all a part of the natural world, part of the web of life. We eat and we all shall be eaten in our time, unless you go for extra crispy (cremation) or pickled (embalming) which are terrible wastes of nutrients and energy. When my time comes I want to be composted and spread on my apple trees, strawberries and rhubarb. Update 2011-03-01: Master butcher Cole Ward has released a set of DVDs containing four hours of cutting instructions for beef, lamb and pork. Check it out! An impressive undertaking under any circumstances. It seems like your dream is on the horizon. I was just wondering, don't things like bacon need to be smoked. I am from Vermont and know they sell the best cob-smoked bacon there. Are you planning on having a smokehouse? Good luck with your undertaking and kudos to you for taking the chance. Your children's children, will someday still survive working your farm. I'm really impressed and hope you are successful. I would like to hear more about inspections and if you needed a zoning variance. Joel Salatin has wanted to do the same thing for years but says he cannot do it in Virginia. I also heard of someone who built a small slaughterhouse in the same area as Salatin. The USDA pulled his inspector because they said he didn't have enough animals coming through. Anyway, I wish you the best of luck. I think that although they were enacted with the very best of intentions and to answer real problems, the regulations governing meat processing have become so onerous that they basically serve only to protect the large meat manufacturers and to limit competition. I would like to see inspection rules relaxed for on farm sales where the customer can do his own inspection. I think it's so great that your pigs can live real piggie lives and then die with as little fear and disruption as possible. I don't live far from Smithfield, VA so I often drive past hog trucks and it's just so sad. Plus the smell could knock a buzzard off a you-know-what. You mentioned shipping out of state? Will CSA packages be available with a surcharge for shipping to say…Indiana? I am in awe of all you and your family have accomplished and wish you all the best in your ventures. It looks like even though you are next to the old house it is not part of the butcher shop. 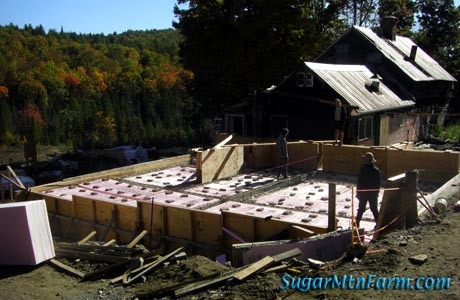 I am still trying to understand the foundation / insulation to ground system of the shop. Isn't all the foam going to compress and the floor crack and sag? Simply Beautiful ( he says, wiping a tear from his Irish eye) ! Bravo and Slainte' my friend!!! Yep, he's gone to the dark side, but he's building it all himself, just he and his family! I'd love to buy some of your pork but I live in SC. If you ever start shipping I'm in line for some. did you investigate getting any support from "slow money" angel investors? It would seem that your slow food operation would meet their investment criteria quite nicely. Excellent job Walter! I hope that your Butcher shop is a success. 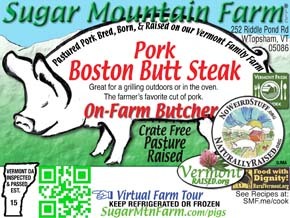 When those doors open for business, I would like to take my family on a road trip to Vermont to purchase real pork! What a wonderful project, not just for your own farm, and your own part of Vermont, but as inspiration for what is possible anywhere. Good for you Walter and your family and your farm. Hard work is the best work .GOOD FOR YOU !! This is most awesome and amazing and just wow! 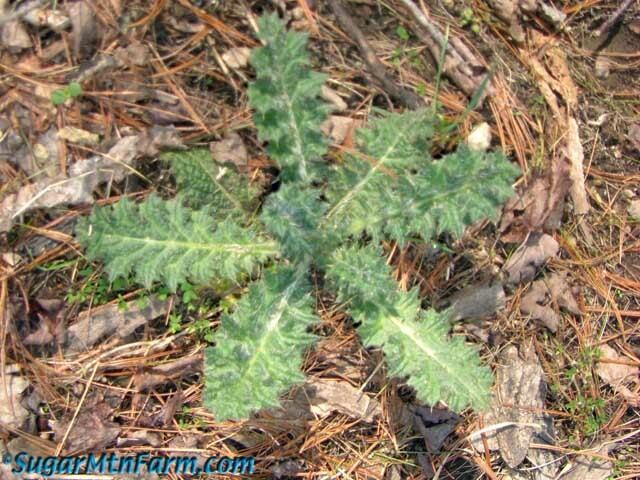 Count me in for a CSA share and let me know what the shipping will be. I am so psyched! Fascinating, Walter! Any chance you could post a link to a larger rendering of the plan itself? I would love to take a closer look so I can understand the movement of the animals. Where is the 'lairage' (don't know that term — I assume it's the term for the area in which animals are kept before they're taken into the abbatoir?) located in relation to the butcher shop? This is awesome news, Walter! So excited! Looking forward to the pork we will get from you next year, and also to the possibility of eventually bringing our culled sheep to a facility that "gets it." Bravo and good luck! Your customers will be surprised at the change in quality when you take over the butchering. When we started doing our own we couldn't believe the difference in quality and taste. We began for the same reasons as you. We wish you great success and that the government keeps their hands to themselves. I have been watching your prgressively almost announcements of this for the last year with great excitement. We are too far away to benefit from your slaughter house directly but this is exactly what our family has been talking about doing. Right now we can only sell on the farm because we cant get usda inspection and there is no state inspected in our state. I hope you will write a book about this with the deep details the things that will help other farmers like us setup our own onfarm slaughter and butchering. Videos too. Maybe video tours of your place when you have it done and cutting instruction videos. Fantastic Post!!! I read and enjoyed every word. It is fantastic to live your dream vicariously through the blog posts over the past months. I look forward to seeing come to realization. I whole-heartedly support your mission and enjoy following along. What a breath of fresh air you and your family are. Thank you so much for sharing your knowledge. 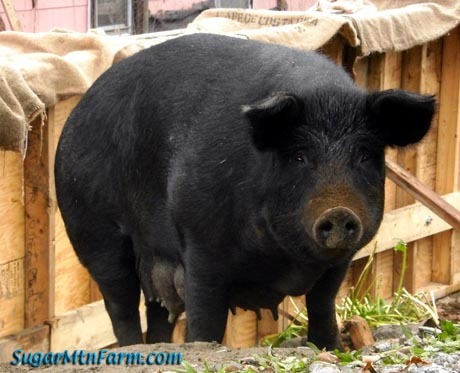 I'm in northern New Mexico and just purchased a breeding pair of Large Black Hogs. I've learned so much about hog raising from you. You were kind enough some time ago to answer my questions about curing ham. Your blog continues to inspire and educate me! Count me in if you need help. If I was close I would offer to come work as I am sure you could use more hands with all that heavy cement and stuff. Your kids are amazing. Your family is amazing doing all that you all do do. You are living my dream man! Walt I have a great idea for you for how to pay for the butchershop…..Sell carbon credits! it is all the rage. You have all that farm land soaking up co2 from the air. How hard can it be to sell the carbon credits? Other ideas I am thinking of thinking about your funding problem…. How about an advance on a book? People have asked you here on the blog to write about your dog training, the pigs, home steading and you could do a book on how to open a small butcher shop. Surely a big publisher will pick this up and the advance could help pay for the shop. How about donations? I would send something? Do a paypal donation button on yoru blog. 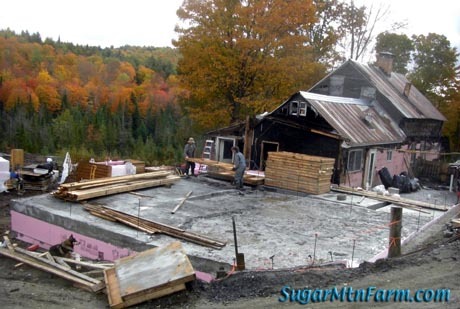 Sell official sugar mountain rocks! You have all that granite. It is really a donation but has a fun chachette. Do a plack on the wall for everyone who donates or what ever to make the butcher shop happen. 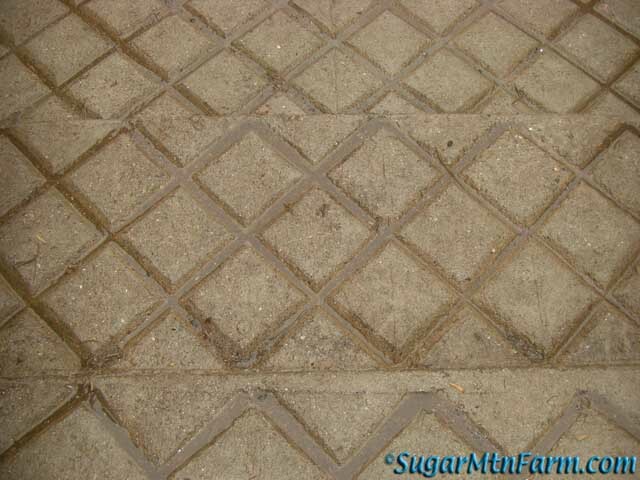 Or pavers in the sidewalk. They did that in our town for a park. Lottery is probably out as that gets into gambling and the goverment laws. So what else can we think of for ways to get this butchershop up and running? I love your pics of the pigs (and those wooly pigs too!) out in the fields chomping away. You have so many years of posts on your blog. Since February when I discovered you I have been slowly reading my way through the whole thing. Better than TV! You people are the real deal. The real thing. I long to be out in the country side doing what your doing. For now I pine away in my city job. I do hope you will ship that Vermont goodness. I love pork, especially bacon(!) but don't eat much since I don't want all the chemicals and stuff. A treat. Mr Ward said it isn't rocket science but he was talking to a rocket scientist — you! Or was your trip to Mars a joke! 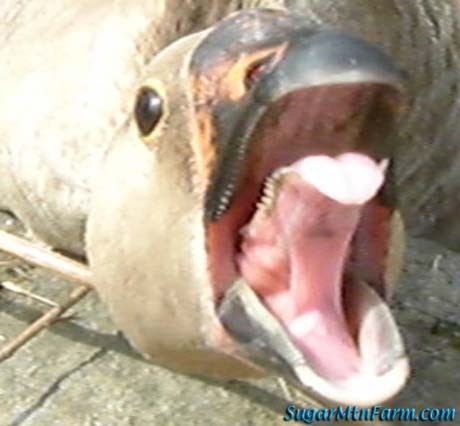 :D I love your humor your information you pictures of farm and family. You are an amazing person with an amazing family living an amazing life and I am greatful you share your journey with us. I learn from you and I am entertained. It is great. Keep us posted as this new journey goes along. I can just smell that tasty bacon from your new smokehouse! I hear you. We know we are not getting all our meet back for our farm. The local plant is the only one for half a day drive. I do not dare challenge him on this and get him pissed off at me. The guy has got a temper like a fire cracker. He is a definite heart attack canidate. Because he over charges us and steals our meat we have to charge our buyers to make up for it which drives up the price of food. That is a big a huge reason why local meat is expensive. The farmers not getting rich I can tell you that no sir no way. I can't see though doing our own plant. We just need the goernment to let us do on farm for our customers. We only do a dozen beef and some sheep every fall so for us it would sit empty most of the year. You with your weekly slaughter make it sound doable though. It makes me think. Awesome blog post. You are some kind of genius and your family is too! I think it's great that you're doing this! I've wanted my own on farm, USDA inspected facility & been told that I wasn't large enough for them to bother with me. How are you getting around the requirement of a separate bathroom & office for the inspector? The extra bathroom requirement is one thing that stopped me. I put it on the back burner until I'm closer to my own children living on the farm. Two of my four children want to give on the farm & work it. I want a processing facility for them to work by then. It's really great that it is workable after all. I don't know that I could build it myself, like you have. But, I can do it in phases. How are you going to get your equipment? I had thought of starting off w/ cheaper… used equipment & upgrade as I could. I do want Hobart, but might have to start smaller. We also want to cure & smoke our meats, as well as make sausage. You say that we should not reinvent the wheel & use the work of others. In that vein… I hope you don't mind if I take your floorplan? I will have to modify it to fit our situation, but I would so love to copy your design! Remember… imitation is the most sincere form of flattery. I would also be interested in viewing a larger version of that floor plan. I can certainly follow the colour code to know which areas are coolest but I was not aware there were so many different zones needed on site. I imagine the RTE Kitchen is a future stage, following the priority slaughter, butcher, chilling and packaging process. I would love to understand as much about the end of these piggies lives as I already read about the beginning and middle. Totally cool project and I am all for it but I have a totally different question that is not at all related. 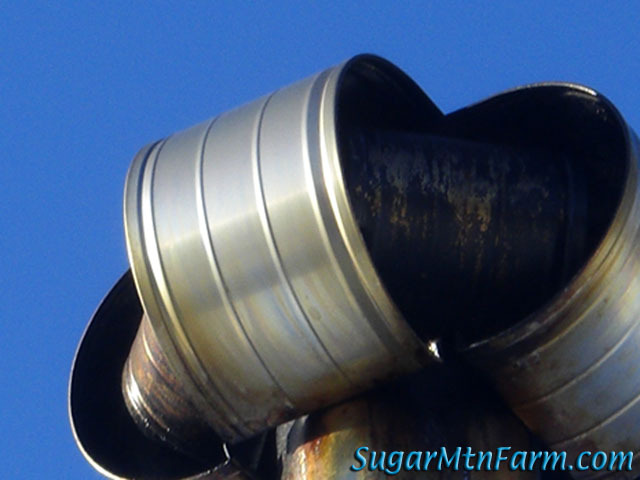 Someone gave me the link to your blog but what they gave me was sugarmtnfarm.com/butchershop and then that link took me to this page which is a different url link. How do you do that? Blog links are so long and I would like to make tiny links like that for handing out to get people to pages in my web site. One reason I read every word of the post was that I was anticipating that you would tell me exactly how you will be dispatching your animals humanely. I can't help wanting to know – so I know and don't have to wonder about it. I like very much the cradle to grave scenario, would just like to more about the last step. I do not know how you do it all. A farm. Home schooling. The good life. Weekly deliveries. Building a house. A clearing land. A butcher shop. Writing. What don't you do Walter? I am totally and massively impressed. You exhaust me and I'm just reading about it and totally excited! I saw the news of the plant in Vermont that got closed. I would be interested in your take on that. The thing that stinks about that is the HSUS was involved. Look them up on activist cash. They are nasty like PETA. I won't sign my name because I don't want PETA or HSUS knowing me. You are brave to farm. I eat meat. I love meat. But I don't think I could do the deed. I respect and appreciate people like you that get the meat to my plate while still caring not just for but about the animal. Bravo to you. I am so excited for you and your family (and your pigs). And also excited for me! My life would be complete if I could say, "Oh no! We're out of hotdogs!… Heck! I'll just scoot over the hill and pick some up!" You mentioned single-species makes it easier to build/manage/inspect. What about your poultry though? Congrats! 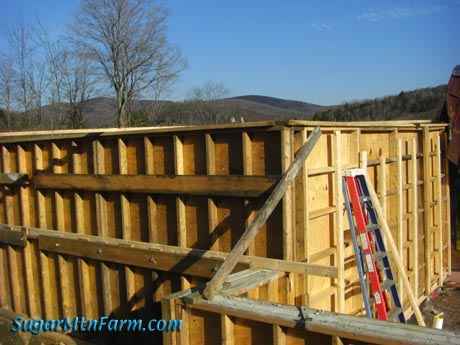 We are finalizing our on farm poultry processing shed. A fair amount of work, but nothing compared to yours. Wish I were closer to you. Couldn't get farther apart (we are in NW Washington. I would be there in a flash, helping with the building and if wished, cutting an wrapping. Love to do that sort of "work" having made 1000's of lbs of wild pork sausage in N. California over the years. Also lamb sausage. Have raised/slaughtered many 100's of home raised chickens too. 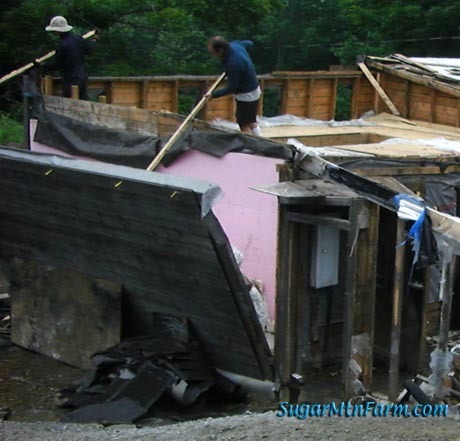 Was an organic farmers in N CA for over 25 years, now "retired" living in NW Washington. Absolutely the best of wished a luck to you folks. 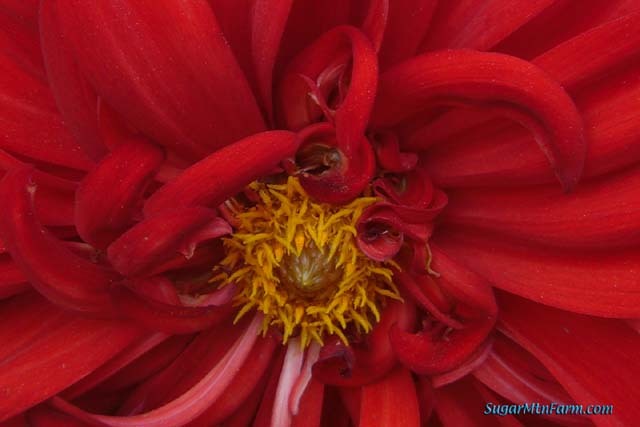 I REALLY love what you are and are trying/going to be doing..
Would you be interesting in sharing your plans, either with a Creative Commons license or for sale at a reasonable price? I'd love to see your incredible work propagated across the country, and I know someone who's looking into building a slaughter facility in my town who might be very interested in seeing your plans. This looks terrific Walter. Got us thinking, that's for sure! For bacon, hams and hot dogs we'll need smoking. There is a space reserved for the smoker (in red) between the office hall and the kitchen. Initially we will start with just on-farm slaughter and butchering, adding other things as we're ready. That may be a few years off. We're doing baby steps, getting our feet under ourselves firmly with each step of the project. We have no zoning – one reason I chose to live here 20 years ago. Even if we did have zoning we would be zoned agricultural since we're a farm and this is a farm activity so it would be covered. At the state level that is something that makes a difference on permitting – which I'll go into in detail sometime. Our entire town is farming and forestry with little else – population under 1,000 and all that. I understand that zoning becomes more important in urban areas where people are packed in close together but it is sad that zoning is abused so much to force out traditional rural activities like having some chickens, hanging your cloths out to dry, choosing what color to paint your house, etc. I'll post more about the whole inspection process. As to number of animals, it may be that in our region they are willing to do smaller butcher shops because there are no big ones around here. I think that every USDA certified meat processing facility in New England may qualify as a "Very Small Scale Meat Processor" – correct me anyone if you know differently. If we were in VA or TX it might be very different. Our volume will actually be greater on a regular weekly basis than some existing facilities much of the year because their work is so seasonal. We deliver fresh pork to our customers every week – that's part of what makes this work for our situation. Several people have asked about the shipping out of state. That would have to come after we get our USDA certificate of inspection. We'll start with the State certificate of inspection and it may take six months to a year or more to make the jump up to USDA. We want it as soon as possible – we need it to transport our meat to the smokehouse in Massachusetts who links and smokes our hot dogs. We have also had requests from stores in New Hampshire but for now I'm holding off on supplying them since our existing customers get first pig, er, pick. We just sell locally but for the special fund raising drive to build the butcher shop I would consider shipping. I will have to figure out what it entails to get the meat shipped safely and maintaining the quality. Holly, Will and Ben are all for it. I'll keep you posted. I'll try to have this figured out by the time I do the CSA Pre-Buy article – coming soon. Correct, the old farm house is adjacent to the butcher shop but will be fully isolated from the butcher shop. This is a requirement of USDA certification. 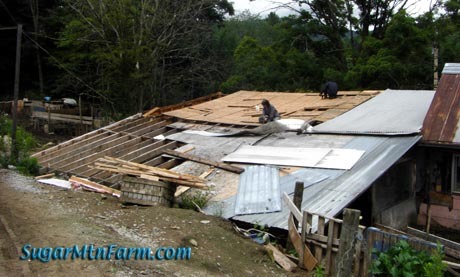 There is a place where a door will be able to be chipped out of the wall in the future should we need more space so we could tear down the rest of the old building and build a meat curing room for example so that we can make salami. From my point of view I want the two isolated thermally because I view the old farm house as a fire trap, a tinder box. They'll be a thick concrete wall between the two. Eventually I want to tear down the old building. If anyone wants it see this. I'll do a more detailed post of the layout sometime and talk about work flow, product flow, air flow, people flow, etc. The lairage is the holding areas for animals between the pastures and the abattoir. In the layout it is to the upper left of the abattoir. Abattoir is French for place where you hit, also known as the slaughterhouse or the kill floor. The carcasses then go to the chiller to cool down, then the cutting room / raw processing / butcher shop for cutting, trimming, packaging and labeling. Sometime I'll write up a post with a long list of resources, most of which are available on the web. Great to hear from you! I got your check in the mail. Everyone, Rick is one of our early CSA Pre-buyers. He and his wife are some of the people I had bounced the idea off of. 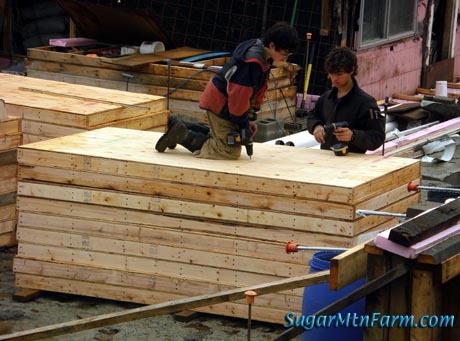 Check out his web site and you can see the great chicken hoop house he made with improvements. You have that right – I have an amazing and wonderful family. It is through us all pulling together in the same direction that we are able to make projects like this happen. It is a team effort. Aye, those wooly pigs are baaaahd. We graze our sheep and pigs together, along with the ducks, geese and chickens as well. They co-graze very nicely, eating things slightly differently. As a group they are better at grazing than any single species is alone. I feel your pain. Keep track of your numbers, work up a business plan, see if it makes sense for you and your farm. If not now then perhaps you can move toward positioning your farm so it will work. We've actually been moving in this direction for years. Many small steps. I just hadn't intended to start doing the on-farm slaughter facility until 2014 or so. Plans are made to be changed. The separate bathroom and office requirements are left over from a bygone day and for larger facilities. For very small plants which do not require a full time inspector they recognize there will not be the amenities of a big plant. They do need a bathroom but that can be shared and they do need a place to do paperwork but that can be shared too both of which should be nearby. I've heard very good things about Hobart and that is what we use in our apprenticeship butchering. Cole Ward, the butcher we've worked with, highly recommends Hobart and I've seen some excellent deals on used equipment. Feel free to use the floor plan and enjoy it. I hope that it gives you good ideas. You'll need to modify it to suite yourself. I don't do engineering for anyone else so you'll have to get that by a pro or do your own. See my note to BradK and Valereee above. Correct, the color coding of the rooms in the layout is for temperature in that layout. You may notice that there is a boxes within boxes design to the temperature gradient. The USDA inspectors that I went over the plans with us really liked that the spaces were broken up into many small separate easily cleaned spaces rather than one large multipurpose space. The RTE (Ready-To-Eat) Kitchen and the smokehouse will follow later once we've got things running smoothly. You can do this using an FTP program and text editor or using a web interface like CPanel. If none of that makes sense then ask the person who handles your web site and give them the above info. In the past on the farm I have used a .22 rifle with the pigs I slaughter here. This is instantaneous, completely humane and never fails me or the pig. Then I bleed out immediately. But I can't do that for meat that is for sale. For the USDA/State inspected facility they would rather one used either a captive penetrating bolt, a captive non-penetrating bolt, electro-cardiac stunning (which some research shows causes pain) or Electroencephalic stunning which is very effective, humane and pain-free. Dr. Temple Grandin and many others have done a great deal of research on this issue. Based on that and my own personal observations I favor Electroencephalic stunning and that is what we plan to use for on-farm slaughter in our abattoir. For more information about death see this post about Kindest Killing Blow. Later I'll write more on this topic as well as about the first time I killed my wife Holly and brought her back so she could testify just how humane it was. All in the name of science, of course. Hi, neighbor! I'm guessing we won't have the hot dogs in stock again until after we get our USDA certification. Soon I hope as they really are delicious. I also want to be making kielbasa again. For each species one needs to do a complete set of Hazard Analysis and Critical Control Point / Pathogen Reduction plans (HACCP/PR). That mouthful often just written HACCP and pronounced Ha-Sip. For each species there is a slaughter HACCP, raw cutting HACCP and deboning HACC and grinding HACCP at minimum. There are also some specialized equipment needs for each species. By just starting with pigs we simplify all of that so we can get it smooth before taking on new things. As to our chickens, they're here primarily for bug patrol. They are heritage breeds, not all that good for meat unlike the meat birds. They do lay eggs. Their primary function is to hunt down the insects, break apart manure in the pastures, weed the gardens in the spring, etc. Yes, I'm quite willing to share. But realize we've still got a ways to go before we're up and running. The race is on to close in before the deep freeze and snows of winter hit. Think hot thoughts! This is absolutely what needs to happen for local food and local farmers to have a future. I'm going to second (third? fourth?) the request for a more detailed plan on the butcher shop. We'll probably be doing one ourselves someday, albeit in a slightly warmer climate with multiple species, but it would be very valuable to see one that's already approved by the USDA and has geothermal cooling or what-have-you built in. The HSUS video is disgusting and highly edited on both the audio and video to get a specific gut emotional reaction out of people. There are a lot of problems with the way the HSUS did their investigation. There are even allegations that the HSUS "investigator" told the slaughter employee to do the things he did. Still, that's no excuse for what was seen in the video. From everything I've read Bushway's Packing did have serious issues both at the management level, employee level and inspection level. If that was really going on like HSUS claims then it should have been obvious to the inspectors and HSUS should have reported it to authorities a lot sooner, not waited with sensationalism. They have done this sort of sensationalizing before. Beware of HSUS and their agenda. As to what happened at the plant,it appears to me from the news stories I've read and what I know about slaughter operations that the big problems there are a result of high speed, of rushing. Speed causes all sorts of problems from stress to the animals, inhumane handling and employee injuries. This produces a mentality of everything must go fast, fast, fast. Time is money to them and a dime is worth more than dignity. That is a top down management problem. 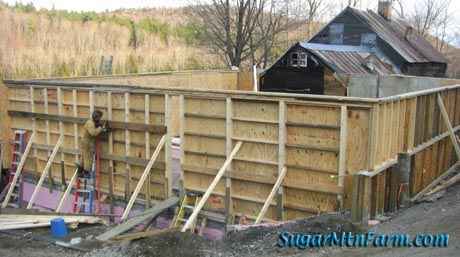 Recent articles I have read say that Bushway's have addressed those problems and are working on reopening. I hope they get it all corrected and resolved. We need good small scale slaughter facilities. A lot of people depended on Bushway's and called us to see if we could slaughter for them even though we're not even open yet. The HSUS's combative way of approaching this and Bushway's actions gives farmers and slaughters a black eye rather than actually fixing the problem. The over reaction to the problem doesn't help. We need a attitude of fix the problem, not throw the baby out with the bath water. HSUS distorted the letter from Dr. Grandin's office. It just lowers my respect, already pretty low, for the HSUS by one more notch. I hope that Dr. Grandin will take the HSUS to task on this issue. By the way, don't confuse the HSUS with your local humane society and animal shelter. They are totally different organizations. Everyone should go read that HSUS link at Activist Cash that you gave. It tells the truth about HSUS and a lot of other organizations. On the subject of the calves themselves, it always saddens me to see the Bob Veal calves (newborn male calves) at the slaughter house – they are skin and bones wobbling around. Frankly I wish that farmers could raise them up on excess milk and pasture for a few months to produce Rose Veal. The calves would put on a lot of weight, a lot more muscle and have six months to enjoy the pastures. This would give those farms diversity rather than being totally dependent on one mono-crop, milk. I know of two farmers who are doing this, figuring out the kinks to make it work. I hope it pays off for them. Something that the Animal Rights Terrorists fail to recognize is that the reality is even in nature, out in the wild, the vast majority of the offspring, especially the males, will die before getting to breeding age. This is the natural order of things. This is especially true in herd animals like horses, cows, sheep, pigs, etc. In herds animals there is one male who services 15 to 100 females. There is no need for more males – simple biological economics. The males mangle and kill each other in their fighting to be that one male. Predators pick off the weak ones. This is evolution working to produce better animals, just like a livestock farmer working to produce better herds. On our farm about 5% of the females breed and about 0.5% of the males breed. The rest go to market. That's actually pretty good compared with in the wild. Cool family project! Your homeschool is the best! I love it when you do the math tricks. You must be good with numbers. Based on you post the other day if you filled that box solid with concrete it would indeed crush the foam. I look forward to reading about your project progress!